There is so much love about street foods in Nigeria. With several trendy restaurants with luxury foods to impress Nigerians, they cling to street foods like it’s their lifeline. They believe you don’t need a silver or gold spoon for tasty foods. If you want to learn about the Nigerian culture, its people and their sense of taste, you need to savor the street foods. Nigerian street foods are tasty and give an unforgettable culinary experience. The street foods are always low-priced, handy and delicious. Akara is a deep fried beans ball made with grounded beans mixed with pepper, onions and other spices. It is a popular street food in Nigeria. Moin Moin is a cooked bean pudding made from grounded peeled beans, onion, and other spices. Street Moin Moin is very delicious, it is either wrapped in leaves or nylon. Puff Puff is a local Nigerian food, it’s always spongy, fluffy and delicious. It’s made with flour mixed with sugar and other ingredients. Abacha is known as African Salad and its a popular Nigerian snack made with dried shredded cassava and other ingredients. You’ll always see Abacha vendors on the streets or around some market angles. Boli (roasted plantain) is a popular and delicious Nigerian street food, you will always find sellers at every street corner. 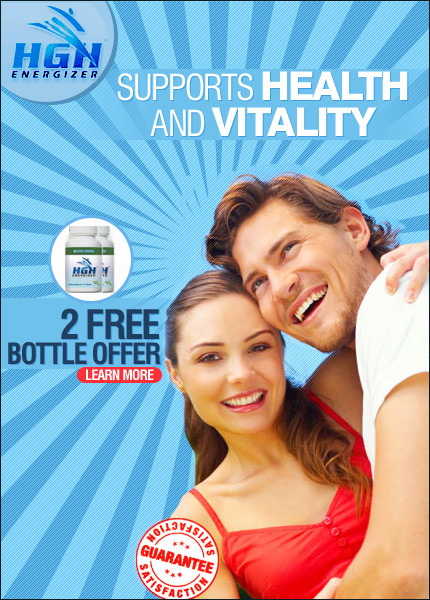 People always say that the combination of Boli and Epa is so great, in fact, the truth of the matter is that it is the perfect combination. Ewa Agoyin is a deliciously cooked beans served with spicy stew. Most Nigerians love eating Eaw Agoyin with the popular Nigerian bread called Agege Bread. Whenever you see Ewa Agoyin sellers, you will see bread sellers as well. 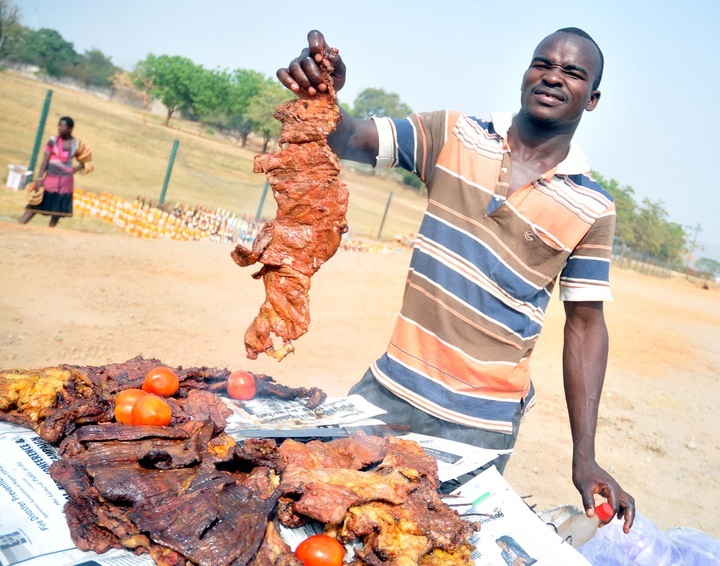 Suya is a popular Nigerian barbecued meat, fish or chicken. You will always find ‘Mai Suya’ – Suya sellers at almost every street angle. Maize or corn is a seasonal food in Nigeria but whenever it comes out, you will find sellers at every street junction. Corn is always roasted or boiled and you will see a lot of Nigerians on a queue waiting to buy either one of them. Gala and Lacacera is the best street food which serves as a preservation of the Nigerian race. 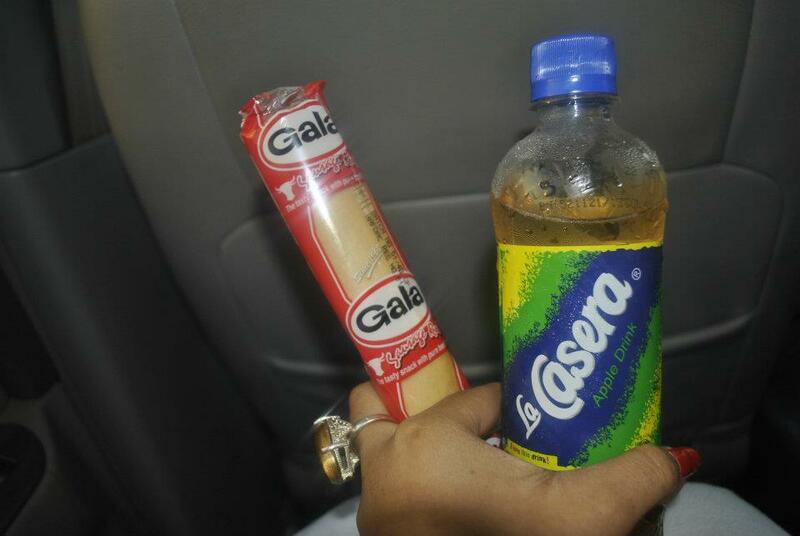 You will find vendors selling Gala and Lacacera at every street corner and on the roads – traffic jam. Plantain Chips is a crunchy street snack in Nigeria. They are made either with ripe or unripe plantain or banana. These chips taste delicious. 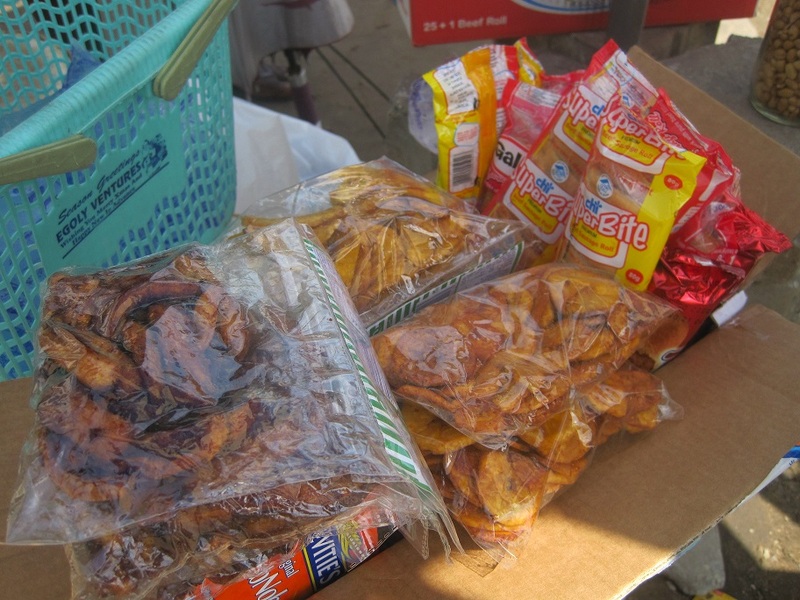 Popcorn, coconut chips, and Fan Milk Ice Cream are popular street snacks in Nigeria. Fan Milk Ice Cream is known to be a thirst quencher on sunny afternoons. Kuli Kuli is a Nigerian street snack made from grounded peanuts or groundnut. It is majorly found in the Northern part of Nigeria. 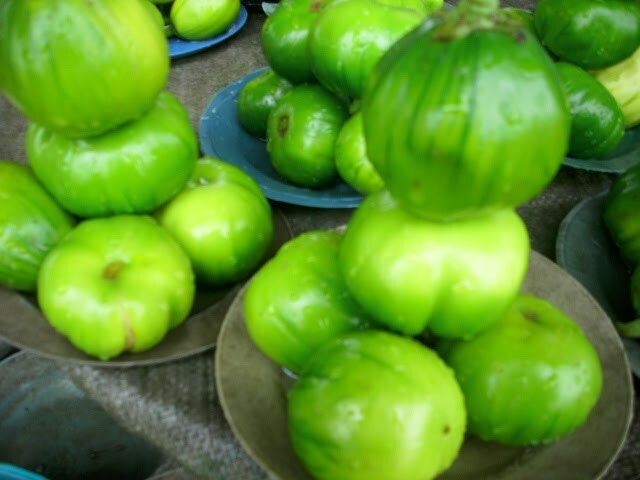 Garden Eggs, also known as eggplant is popular street food. You will find Garden Egg sellers at every nook and cranny. Groundnut, also called peanuts is a popular food in Nigeria. 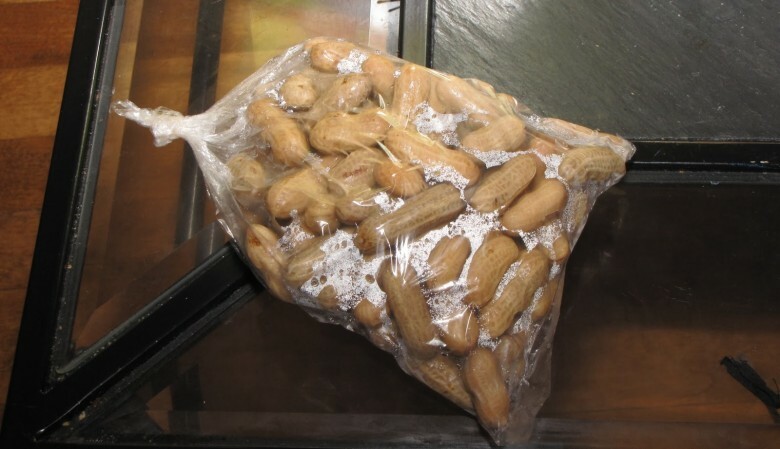 Boiled Groundnut (peanuts) is a popular street food. Some are boiled with salt, which makes them tastier. They are available everywhere, you will find groundnut sellers even on the roads. Wanke Rice and Fish are known to be a Ghana recipe, made with rice and beans with fried fish. Wanke rice has become a popular street food in Nigeria. Some unmarried men stop at the food stall to buy Wanke rice for dinner after the close from work.